Project Connect is funded by the Big Lottery Fund as well as the Belfast Health and Social Care Trust and the Western Health and Social Care Trust. Project Connect provides practical support to young people with Learning disability and/or autism aged 16-20 who are preparing to leave school. At present the project works with young people attending special and mainstream schools in Belfast, North Down, Downpatrick, Lisburn and Strabane but is not limited to these areas. 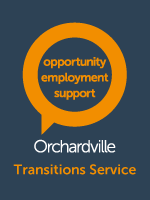 Transition Officers develop an individual programme with each young person to develop important skills needed for leaving school. This includes travel training, money management, independent living skills and activities that promote a healthy lifestyle. Transitions Officers also organise and support young people in work experience opportunities with a variety of employers. To fully take part in the project young people usually require one day per week out of school and staff work closely with parents and teachers to arrange this. To apply please discuss with the SENCo at the relevant school or Transitions Co-ordinator in the Education Authority. Completed application forms can be sent to Lydia.lynas@www.orchardville.com with applications generally accepted between April to October for each new academic year. The form can be completed by teachers or other educational professionals, a social worker or by parents/carers ensuring that all sections are fully completed.